Last week, my coach (Steve O’Brien) and I made the trip over to Wollongong so I could compete in the Australian AG Standard Distance Championships. This event was a race that we’d chosen back in June 2015 as one of two interstate A-races for the 2015/2016 season. We picked this race as an opportunity to gain some interstate racing experience at a major event with a competitive field - with the goal being to see how the last couple months of training had been going and to have a look at the standard of interstate competition. 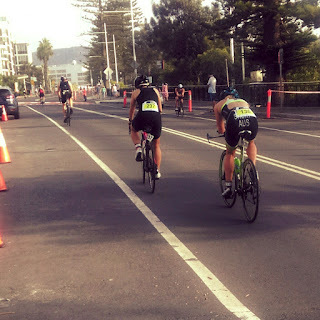 It was also my first interstate trip for triathlon and my first standard distance race since taking up the sport. After training for months for the event, it was exciting to finally be leaving for the event! We arrived on the Friday and completed a sharpening run set followed by some pre-race recovery and planning while touring the coffee shops of Wollongong. On Saturday morning, we completed a short speed/stroke count variation set in the harbour in my new Orca Alpha wetsuit to get a feel for the swim venue and to find some landmarks for sighting during the race. After the swim, we headed out onto the bike course to look at some of the technical aspects of the course, settle on some race strategies and look for some opportunities for gains – in this case the descents. In the afternoon, we watched the Women’s OTU elite race where I was able to see an amazing field – including world no. 1 ranked Gwen Jorgensen – sprint it out over a similar course to what I would be racing. It was an amazing opportunity to see some incredible triathletes compete. Race day started early – waking up at 4:45am to have breakfast before the race was a struggle but I managed to make it down to transition with plenty of time to set up (it helped that I was staying 5 minutes from the race start) . After finding out it was a non-wetsuit swim, my coach and I headed off away from the transition area to the harbour to complete the regular pre-race warm up and a swim warm up. I was then ready to go for the 7am race start. By this point, I was done with waiting and was more than ready to get the race underway! The race start was pretty frantic with my wave start including all women under 30 – almost 60 people! But, I was able get away with a good start and complete the rectangular swim course well – and almost precisely on our race schedule. After completing a serious block of swimming in the month’s leading up to the race, I was relieved to see the hard work my coach and I had invested pay off as I completed one of my best swims over the 1500m open water course despite some serious waves and plenty of congestion. Amazing to think that less than a year ago I was swimming at 17m30 for 1km. Completing the swim, it was quite a long run to transition to grab my Merida Warp Tri 5000 and then head out onto the course, which started with a tricky climb straight out of transition. The bike leg flew by – made all the more exciting by a large and extremely competitive under 30 women’s field, which provided me with plenty of incentive to race hard! I was stoked to finish the bike leg within the time Steve and I had set, and then finish off the race with a solid 10km run over a slow run course – with one of the fastest splits of the day. I finished the race with a win in the 20/24 AG and an 8th overall. Overall, the race weekend was an incredible experience and went exactly as we had planned it, and prepared for. It was amazing to have the opportunity to compete at such a professional and exciting event against a really impressive field. 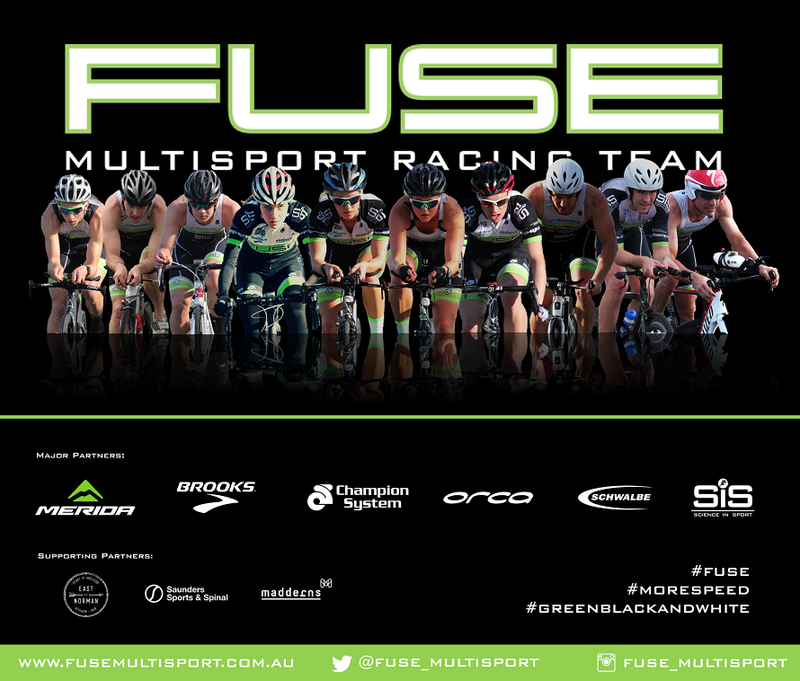 I can’t thank my coach and my team mates from Fuse Multisport enough for helping me through the months of work it took to prepare me for this event! I also want to thank our team’s amazing partners – Brooks Running Australia, Champion Systems Australia, Merida Bikes Australia, Orca Australia, Madderns Patent and Trade Mark Attorneys, Schwalbe Tyres, Saunders Sport and Spinal (and especially Craig Fountain) and Science in Sport Australia.